Phil Harper Motorsports has announced that Ilmor Engineering, based in Plymouth, Michigan, has purchased Phil Harper Motorsports along with Scorpion Racing Engines. This sale will help Phil Harper, Owner of Phil Harper Motorsports and Scorpion Racing Engines, do more for his current and future customers. Harper has been looking for a partnership like this for a long time, and he finds some great benefits for this acquisition. Paul Ray, President of Ilmor Engineering, Inc., agrees that the acquisition is right for his company. “We have done some business together over the years as Phil Harper Motorsports is about five miles from us. Several of our employees have worked with Phil,” Ray explained. “Phil has an outstanding reputation and has a small but high quality facility. “Phil approached us merging his companies with ours and it was an idea that doesn’t come along very often. We have wanted to get into short track racing and offshore boat racing. With what Phil has to offer, along with his strong customer base on both sides, it was an easy decision. Harper agrees that this merger is right for both sides. Phil Harper Motorsports clients are a who’s who in the Pro Late Model ranks. Some of those clients include: Harrison Burton, Cody Coughlin, Spencer Davis, Brandon Odom, Chase Elliott, Anderson Bowen and Bubba Pollard. His engines have won the last four out of five Snowflake 100’s at 5 Flags Speedway in Pensacola, Florida. Ilmor Engineering, Inc. (www.ilmor.com) is widely recognized as one of the most successful high-performance engine design and manufacturing companies in the world. They have been building IndyCar racing engines since 1984 along with building engines in ARCA, NASCAR and Go-Karts. Ilmor’s resume includes 18 Indianapolis 500 wins with 275 Indy Car victories overall. One thing that Ray and his team at Ilmor Engineering hope to do more this year is celebrate victories, especially now with being more involved in short track and offshore racing. Harper plans to remain at his current facility in Livonia, Michigan until mid-summer. He then will be moving over to Ilmor's state of the art, engine build facility in Plymouth, Michigan. For more information on Phil Harper Motorsports, visit www.phmotorsports.com. For more on Ilmor Engineering, visit ilmor.com. 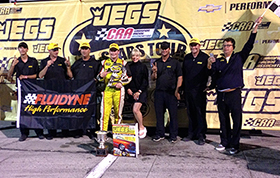 Cody Coughlin and the JEGS No. 1 team have been to victory lane with Phil Harper Motorsports.